Fashion ComPassion is an ethical fashion retailer that stocks luxury brands from the developing world. The company works directly with their artisan designers to make sure they are properly trained and skilled; this not only means better quality clothes for us, but it also ensures they the designers get better pay, and a sustainable source of income. As well as having fair and ethical trading standards, ComPassion support marginalised women by donating a percentage of their sales to charities such as Oxfam, Women for Women, Friends of the Citizens Foundation, and The Girl Effect. Beshtar - made by the people and from the textiles of Afghanistan, Beshtar means 'more' in Dari, and aims to do more for the country. Bhalo - handmade by women in rural Bangladesh, Bhalo is an eco-friendly brand, using naturally dyed cottons and silks. The word means 'good' in Bengali. Lost City - handmade by artisans in Lucknow, Lost City is a distinctive eco-friedly urban brand, that uses embroidery. Nawa - an Arabic word meaning 'seed', Nawa is a social project that began in 2011, and aims to create a better quality of life for people in poor communities around the world. Palestyle - Embracing the history of handmade Palestinian embroidery and Arabic calligraphy, Palestyle clothing is made by women in the refugee camps of Jordan and Lebanon. SOUGHA - a social enterprise, SOUGHA, aims to create opportunities for underprivileged Emiratis. GUNAS - a progressively minded handbag fashion brand. 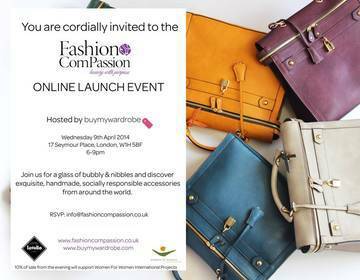 On the 9th April, Fashion ComPassion is holding a party to celebrate the launch of their new online boutique store. Hosted by Buy My Wardrobe at 17 Seymour Place, the event runs from 6pm-9pm. Entry is free, but you will need to book tickets. There will be bubbly, nibbles, and first dibs on their new range. 10% of sales will go towards Women for Women.